A recreational power boat sank Monday morning at the San Rafael Yacht Harbor, about two weeks after the owner was found dead. Police raced to the harbor at 557 Francisco Blvd. E. about 4:45 a.m. after receiving word of the sinking boat. The US Coast Guard was able to retrieve the boat, and along with harbor crew teams, clean up all the oil that was leaking from the boat so as not to harm the environment. Friend Gregory Johnson said the boat owner died and was found on Christmas. He said he also heard a loud bang about 4 a.m. Monday just before the ship sank. "This whole thing just doesn't make sense." Brennan Newsom, who said he is a cousin of Calif. Lt. Gavin Newsom, said it was his sister's boat. 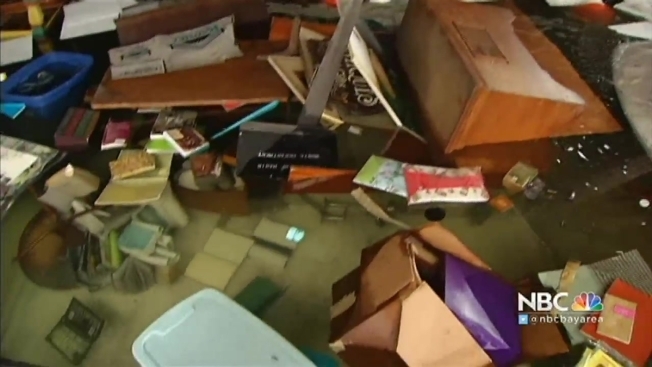 Now, he'll have to figure out to do with the antiques and belonging that were once on the boat, and are now 10 feet below the surface of the water. "I'll just deal with it day by day," Newsom said.
.@SanRafaelPolice confirms it got a call 4:45am ab possible sinking boat at Yacht Harbor (Francisco Blvd). Don't believe anyone was onboard.